The problem we are intending to address is that children and young people at the margins of society, such as those on the edge of Barnardo’s services, have things to say but lack the means to be heard. Often media stories reinforce and actively construct negative stories about people who access services, while such characters are often omitted, marginalized or stereotyped in children’s literature. This lack of audience for their own perspectives on aspects of their lives further erects barriers to children and young people’s agency in improving their own lives and those of other children and young people in their community. Cycles of negative experiences can shape expectations, perspectives and the stories children and young people tell about themselves and the communities they inhabit. However, stories have equal potential to be transformative; the nature of stories is that they are dynamic and can be told as a means of reaching out and creating connection. Children’s literature is an effective means of educating and changing attitudes; but books are not always accessible or available to children and young people with limited social capital and limited print literacy. The use of phygital artefacts placed in community venues to tell the children and young people’s stories will provide novel alternative means of accessing stories using different emergent forms of oral, written and digital literacy. By using an appreciative approach whereby children and young people are encouraged to create affirmative stories based on their own lives, the stories collected during this project will act as counter-narratives, presenting alternatives to challenge stories which perpetuate commonly-held assumptions about people who access services. In research for the Office of the Children’s Commissioner, stories collected from disabled young people and parents had a powerful impact, improving understanding and self-image for disabled young researchers and their workers. 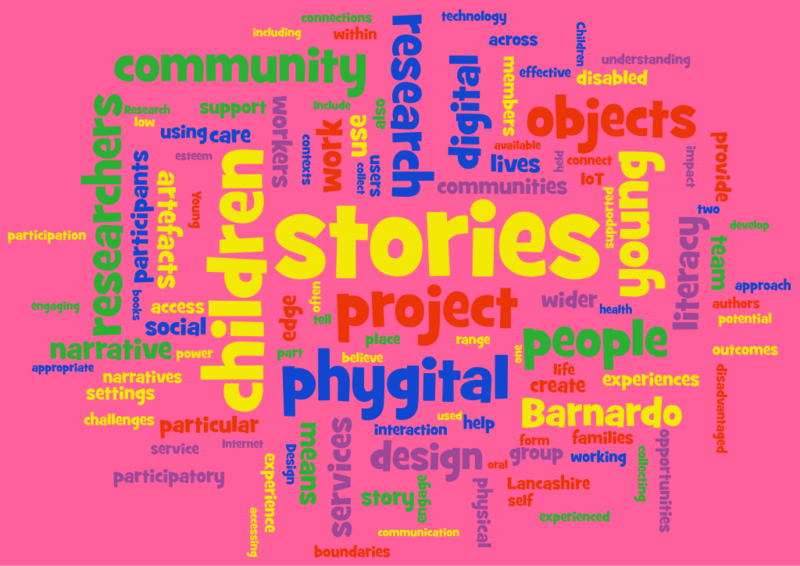 Building on this work, and transforming further stories collected by and from other disadvantaged children and young people into user-friendly phygital objects, we seek to spread the kind of benefits these young researchers experienced to members of their wider communities. Talking about collaborating in this research project, Barnardo’s stressed the benefits of children and young people being able to ‘gain support from peers, and express their thoughts and feelings in relation to a range of issues important to them and regarding issues they encounter in their day-to-day lives’. Recognising the children and young people as experts on their own lives will ‘improve their self-confidence and self-esteem; and their training as researchers will provide them with life skills in active listening, empathy and literacy’. Barnardo’s will use the resources ‘to help promote the fact that Looked After children and young people are valuable members of our communities’, and believe the project will ‘help connect communities with a deeper and more honest understanding of life and the challenges facing children and young people living in the care system’. To generate narrative phygital artefacts that give voice to disadvantaged children and young people on the edge of care and those who access children’s services. To create opportunities for transforming disadvantaged children’s self-image and esteem through creating capacity for their stories to be shared in the form of community artefacts. To create connections within and across families on the edge and in the wider community through the use of new and emergent forms of literacy and means of interaction realised in phygital narrative design. To identify the most effective means of conveying meaning through narrative to the target audience which may include children, young people and adults with low levels of conventional literacy. To collect narratives from children and young people about their life experiences – both positive and negative, but with an emphasis on positive outcomes. For participants to design and create, in collaboration with phygital designers and well-known children’s authors, a collection of inter-connected narrative phygital artefacts based on their own stories. To evaluate the effectiveness of the resulting phygital artefacts and the use of narrative to inform a greater connection within and across the wider community. To evaluate the impact of narrative research and collaborative design on the participants themselves. Booktrust (2006) Making exclusion a thing of the past: children’s views on disability in books; Dahl, M. (1993) The Role of the Media in Promoting Images of Disability- Disability as Metaphor: The Evil Crip. Canadian Journal of Communication 18; Burgess, M (2011) Kill All Enemies. Frank, A.W. 2010, Letting stories breathe : a socio-narratology, University of Chicago Press, Chicago, Ill; Carter, B. 2004, “Pain narratives and narrative practitioners: a way of working ‘in-relation’ with children experiencing pain”, Journal of NManagementNursing Management,12.